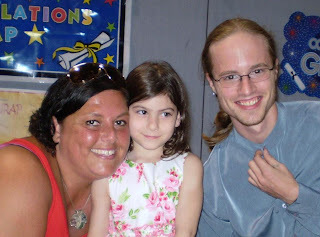 Genevieve's kindergarten wraparound program at the YMCA had the most amazing graduation ceremony last week. Miss Karen is absolutely fantastic. She choreographed several numbers plus had the kids recite the 50 states in alphabetical order, gave out diplomas, ran a slide show, and more. Genevieve's dance recital a few days later was disappointing compared to the dances they did at graduation! They did a second performance this week, since one of the girls got injured just before the original and missed it. These videos are from the second showing because our camcorder battery was acting up the first time. Check out the "hoe-down"... Genevieve got to be the announcer, and as you can see, she wasn't shy about it at all. I'm having trouble uploading the YMCA dance. I'll try that in a separate post. At the original ceremony the kids were more dressed up. 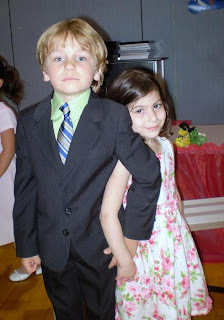 Here's a photo from graduation day of Genevieve with her "boyfriend", Dylan. They looked ready for the prom. And here she is with her awesome teachers, Miss Karen and Mr. Mike. The kids also each got up and said "when I grow up, I want to be..." Genevieve said she wants to be a vet. That is the first I had heard that one from her, but it totally fits since she's such an animal lover. The boys said things like policeman, soldier, "swat team"... the girls mostly said things like artist, movie star, horseback rider. Sigh. One little boy managed the word "archeologist", and one little girl said "doctor". I cheered for them. 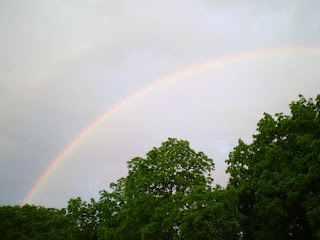 Perfect ending to the day: when we stepped outside after the ceremony, there was a rainbow! It was all so precious. I can't believe kindergarten is over already!! wow. Kindergarten is over and she's going steady. Life is so short! I love your new blog--I'll be checking for more posts!